Many years ago at a bookstore in a small university town in the US, I came across a beautiful picture book which I had to immediately buy. 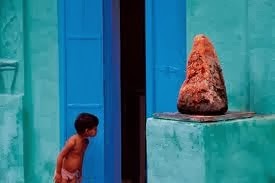 The book titled Living Faith: Windows into the Sacred Life of India is a collection of photographs taken by the noted Indian photographer, Dinesh Khanna. I had seen some of his pictures on the web, but this book really made me an admirer of his work. “…something of what India does, at its best: namely, to take individual moments of worship, private acts of devotion – the soul in solitary colloquy with its God – and somehow bind them into the larger fabric of society and life” (p. 21). The book beautifully captures a living expression of the deepest human urge to somehow connect with the Infinite, the Divine. It is this urge, this aspiration which expresses itself in many different forms; some only catching one or another aspect of this aspiration, some expressing more perfectly and integrally than others, but all expressing a loving way to feel closer to the Divine, to the Infinite. Religion and religiosity are first human expressions of such a deep spiritual urge. And in India we find such visual expression of religiosity pretty much everywhere, in almost every street corner. This is what the book Living Faith represents very beautifully. The sheer profusion of the “sacred” in public spaces can seem mind-boggling to an outsider, but to an Indian eye this is how it has always been. 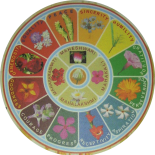 This is merely an external, a visual representation of the Indian ideal of the spiritual aim of life. “A spiritual aspiration was the governing force of this [Indian] culture, its core of thought, its ruling passion. Not only did it make spirituality the highest aim of life, but it even tried, as far as that could be done in the past conditions of the human race, to turn the whole of life towards spirituality” (Sri Aurobindo, CWSA, Vol. 20, p. 178). The photographs in the book clearly speak to the fact that the separation between the human and the Divine, between secular and sacred is not as sharp and divisive in the Indian collective psyche (including its public and private spaces), as seen in most Western societies. An Indian temperament very naturally believes and lives with the truth that there is more to the visible world of Matter, that there is Divine Presence in all of the world and life that we see, and that spiritual aim of life can co-exist with other aims of life. This is how most Indians know and experience India. Barring a few elite metro areas which try to imitate a somewhat artificially created, almost-sanitized, western style urban-ness, one still finds in the majority of urban India (and certainly in small town and rural India) a living, pulsating, throbbing human expression of an attempt to constantly bring the Divine closer to human – in a make-shift temple created by simply placing an old, half-broken murti of a deity or simply a stone marked with holy red powder, or a picture of one’s favorite deity glued awkwardly on the dashboard of a car or taxi….almost everywhere. Bhakti, love for the Divine, is certainly the most common form of spiritual practice for majority of people in India. It is everywhere, in all religious traditions. The book, Living Faith, is an excellent visual representation of this governing force of Indian culture. (Click here to see some photographs). “When we say that India is spiritual, “we do not mean that all or most Indians, or even a very large minority among them, are adepts in spirituality, or that the attachment to life, the passion for earthly possessions, the sway of the six ripus are in any way less prevalent in the Indian character. On the contrary, it may well seem to the casual onlooker whose eyes are occupied with the surface actualities of the situation, that the Indian nature, as it is today, shut out from this world’s larger spaces, cut off from its deeper channels and movements of greater magnitude, has been given over more and more to petty worldliness that hardly fill the same space even in the life of peoples who are notorious for their worldly and unspiritual temperament. “It is not so much a question of concrete realization, of attainment and achievement arrived at by the Indian people in their work-a-day life, but primarily and above all a question of ultimate valuation, of what they hold as the supreme ideal, of what they cherish in their heart of hearts, and of the extent to which that standard has obtained general currency among them. It is not a fact with which we are concerned, but the force behind the fact, and the special nature and purpose of that force. It is the power that we discover in the general atmosphere, or that emerges in the stress and rhythm of the cultural life of the people, in the level of its inner consciousness, in the expression of its highest and most wide-spread aspiration, in the particular stamp of its soul.” (Collected Works, Vol 1, p. 157). The book, Living Faith, is an excellent visual representation of this India, the India which continues to live for and aspire toward the “supreme ideal”, the India which continues to express and live with that certain force and that certain “power that we discover in the general atmosphere, or that emerges in the stress and rhythm of the cultural life of the people, in the level of its inner consciousness, in the expression of its highest and most wide-spread aspiration, in the particular stamp of its soul.” That force, that power is the Living Faith which sees and tries to experience the Divine in All and Everything and yet Beyond All and Everything. Sri Aurobindo in his Letters on Yoga gives a precise definition of Faith, or rather the truer Indian word for it, śraddhā. “Faith is a general word = śraddhā — the soul’s belief in the Divine’s existence, wisdom, power, love and grace—confidence and trust are aspects of faith and results of it. “Confidence is a feeling of sureness that the Divine will hear when sincerely called and help and that all the Divine does is for the best. Śraddhā is not just a blind faith or merely an intellectual belief; it is in truth a firm confidence and trust, a steadfast belief of the soul in the Divine, in the Infinite Existence beyond the Finite, in the Wisdom, Power, Love and Grace that express the Nature and Work of that Infinite. Cultivating this śraddhā requires deep aspiration and true sadhana on the part of the aspirant, along with the Grace from the Supreme. A person who has acquired śraddhā, the kind of steadfast faith which no intellectual doubt can be allowed to disturb, who has conquered and controlled the mind and senses, who has fixed his whole conscious being on the truth of that supreme Reality in which all exists, attains the true Self-Knowledge and the Supreme Peace, says the Bhagavad Gita. An ignorant without faith or one who is full of doubts, neither enjoys this world nor any world beyond. “…it is true that without faith nothing decisive can be achieved either in this world or for possession of the world above, and that it is only by laying hold of some sure basis and positive support that man can attain any measure of terrestrial or celestial success and satisfaction and happiness; the merely sceptical mind loses itself in the void. But still in the lower knowledge doubt and scepticism have their temporary uses; in the higher they are stumbling-blocks: for there the whole secret is not the balancing of truth and error, but a constantly progressing realisation of revealed truth.” (p. 204). Dinesh Khanna’s book, Living Faith: Windows into the Sacred Life of India is a remarkable attempt to capture some moments that express this śraddhā, this faith that no intellectual doubt can disturb, this quest for a higher knowledge of the self, knowledge which relies on a constant progressive inner realisation of the higher and deeper truth. It presents to us sacred moments of that faith-filled spiritual quest which is “living” and “breathing” and not merely an intellectual-philosophic pursuit. Interested readers may like to read an interview with Dinesh Khanna to know more about his take on this book. And for a gallery of some stunning images from this book, click here. Those thoughts about Indians and India are so refreshing. It’s like saying that our beliefs and faiths are unique to each one of us. Those photos too are amazing. The India as we see. Thanks, Parul. I am happy you enjoyed the post and found it refreshing. There is so much that we don’t really reflect upon when it comes to understanding what is unique about India and Indian culture. The deeper meaning of “Faith’ is one such aspect, I think. That’s what made me put together this post. Yes, the photographs are quite something, aren’t they! Ma’am, this is not exactly relevant to your post, but I am curious to ask you(as a sadhak of integral yoga): what kind of spiritual practice are you into ? I am not comfortable talking about that in a public space like this. But to be very brief, if one can try and remember Her all the time, in every activity, in every movement, that in itself can be a great step. I pray to Her to give me such remembrance always. This entry was posted on November 6, 2017 by Beloo Mehra in Art, Books, India, Spirituality and tagged Hinduism, Indian Culture, Photography, Spirituality in Life.